This small, seasonal waterfall is not much to write home about, but is worth a visit if you live nearby and want a pleasant stroll through a lovely little canyon. 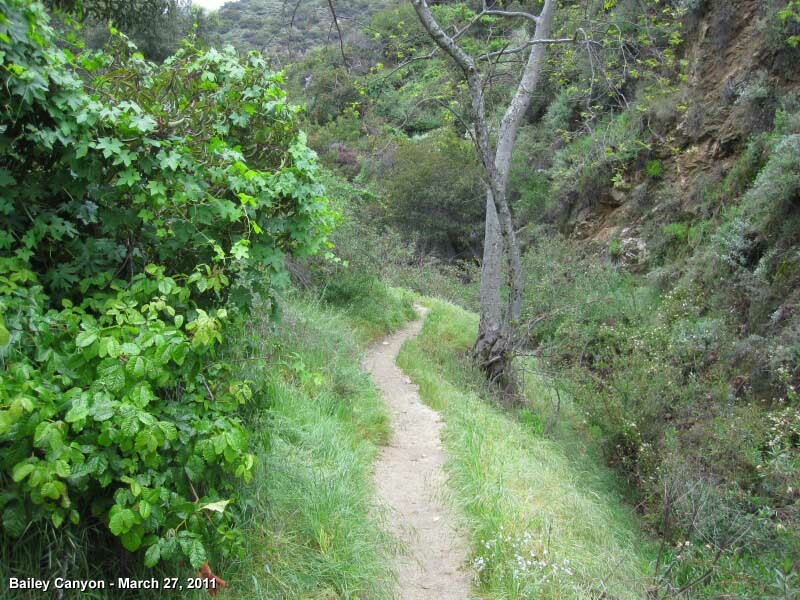 It makes a good hike for children, but be careful of the poison oak. Bailey Canyon Trail is not as renowned as its famous neighbor to the immediate eastMt. Wilson Trailbut is highly popular with local joggers, walkers, dog people. This hike can certainly be done all year long, however if you intend to view water in the falls, you will want to hike in the winter or spring after some good rains. In the spring the wildflowers and lush green flora is delightful. I enjoy doing waterfall hikes on gloomy, cloudy days, when I really don't want to hike to a peak with obscured views. The overcast weather also defuses the light making for better conditions to photograph the falls. From the 210 Foothill Freeway westbound in Arcadia exit Baldwin Avenue. Drive north (toward the mountains) on Baldwin 1.2 miles to Grandview Avenue and turn left (west). Drive 0.5 mile to N. Grove Street (one block past the stop sign on Lime Street). Turn right (north) on Grove and drive 0.2 mile into Bailey Canyon Park parking lot. The trial begins on left (west end of the parking lot). From the 210 Foothill Freeway eastbound in Pasadena exit Rosemead Blvd./Michillinda Ave. Turn left (east) on Colorado Blvd and drive 0.2 mile to Michillinda Ave. and turn left (north). Drive 1.3 miles on Michillinda to W. Grandview Avenue (0.3 mile past Sierra Madre Blvd.). Turn right (east) on Grandview and drive 0.4 mile to N. Grove Street (no stop sign). Turn left (north) on Grove and drive 0.2 mile into Bailey Canyon Park parking lot. The trial begins on left (west end of the parking lot). The address for Bailey Canyon Park is 451 W. Carter Ave., Sierra Madre, CA 91024. The park hours are sunrise to sunset. From the Bailey Canyon Park parking lot, take the signed trail which starts on the west end of the parking lot. Walk a couple minutes to a pedestrian gate with a turnstile. Go through the gate and turn right (north), walking up the paved service road past a debris basin on your right. The road soon becomes dirt and narrows into a nice trail. There will be a sturdy footbridge on your right (leading to Live Oak Nature Trail), but you'll continue straight ahead. After about 5 minutes from the bridge you reach a signed junction ("Canyon View Nature Trail Water Fall 1/4 mile"). The right fork heads up the slope to Jones Peak. But to get to the falls, you'll go left. 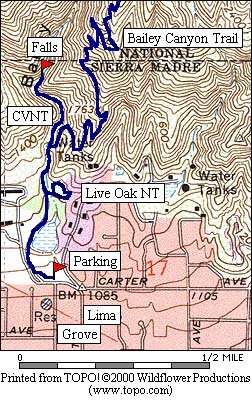 The path immediately drops into the creek bed, crosses the creek, and soon bends left The route crosses the creek many times. A few places are a little dicey, so young ones may need some assistance. And watch out for poison oak. At one point the route passes under a large tree branch with about four feet of clearance while crossing over the water. 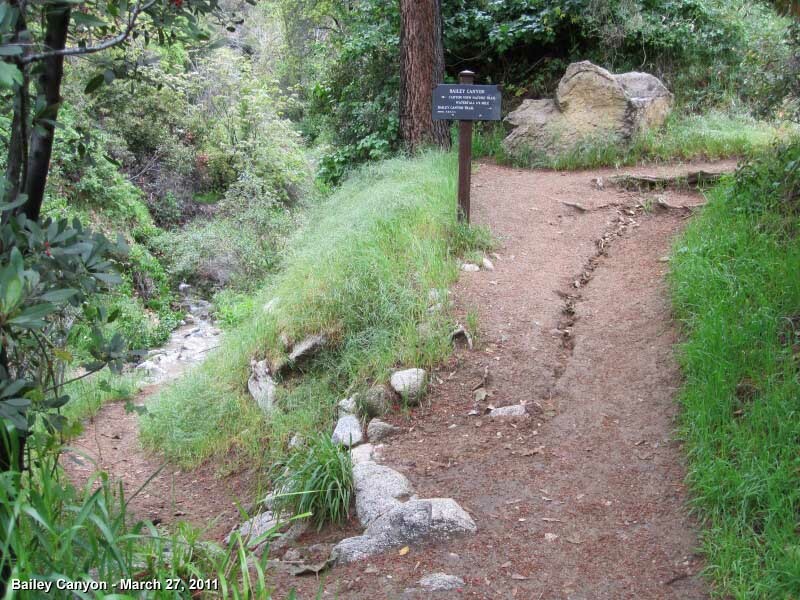 Shortly the path makes a sharp right to bring you face to face with Bailey Canyon Falls. The water pours over a notch in the black rock and plummets about 15 feet into a little pool. The steep granite walls nicely frame this picturesque setting. People Traffic: This popular trail attracts lots of traffic, particularly on the main route. On a hot summer day when I hiked down (7-10-04) from Jones Peak, I had the entire 3.3-mile trip from summit to trailhead all by myself. When I hiked to Jones Peak on 11-24-05 (Thanksgiving morning), there were lots of hikers on the trail. When I hiked to the falls on a cool Wednesday morining in February (2-15-06), I had the falls portion to myself but passed several walkers on the main trail. When I hiked to the falls on a cool Sunday in March (3-27-11), I had the falls portion to myself but passed several walkers on the main trail. Bailey Canyon Trails - by Tom Chester. Detailed mileage for the various trail sections, background information, topo maps, and links. 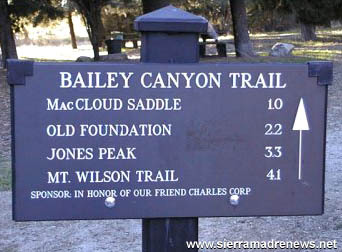 Official Website of the City of Sierra Madre: Bailey Canyon Park - Provides basic information about the park. Adventure Hikes and Canvoneering in the San Gabriels by Christopher E. Brennen. "Hike D7. Bailey Canyon." Provides thorough information on a cross-country hike down Bailey Canyon from the old cabin foundation. This route requires technical skills and equipment. Trails of the Angeles: 100 Hikes in the San Gabriels - by John Robinson with Doug Christiansen (Wilderness Press, 8th Edition, April 2005). Hike 34: "Sierra Madre to Bailey Canyon, Jones Peak." This hike was added to the 8th Edition (not in previous editions). They direct the hiker to the falls as part of route to Jones Peak: "...you reach a junction. Turn left and walk a short distance to a small waterfall, then right to Jones Peak." Unfortunately, this is vague and misleading. It suggests that the route continues from there rather than stating that the hiker needs to walk back to the main trail junction, and then turn right (which would actually be left). Afoot and Afield in Los Angeles County - by Jerry Schad (Wilderness Press: Berkley, 2nd Edition, Sept. 2000) - Area A-6, Trip 8: Bailey Canyon. 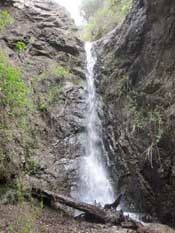 Brief description of the hike to Bailey Canyon Falls (1.2 miles round trip). Jerry first published this account (1990) before the trail was complete to the summit, but failed to update it for the 2nd Edition (2000), long after the trail was complete. Also Jerry's description of the falls is misleading. He writes of a "dike of black gabbro rock" which makes it sound like a man-made structure. It's actually a natural waterfall. Also he writes, "After a wet storm you could possibly wade this last stretch and behold an impressive waterfall here." Actually, there is no wading involved to see the falls. You round the bend and see the falls in its full glory, about 75 feet in front of you. You may have to wade if you want to take a cold shower under the falls. Los Angeles County: A Day Hiker's Guide - by John McKinney (The Trailmaster: Santa Barbara, 2006). "Bailey Canyon Trail." Gives some historical background and describes the 6.6-mile round trip hike to Jones Peaks and mentions the side trail to the falls. This page was last updated February 14, 2017.